When Shaun came home last night, I told him I’d been out running and because I’d been out running I needed some new running shoes because mine were a year old. He said I couldn’t have new shoes because a) yes, they may be a year old; but b) I’d only worn them once. I decided on c) I wanted new shoes and I was going to get some anyway and so he said ok, I want some new shoes too, shall we go now? And so we drove 20 miles to the nearest Sweatshop and a man with nice legs gave me the latest Asics Cumulus but I didn’t really like them and so he brought me out some Asics Nimbus 13 to try on and said they were a bit more expensive and I had a flashback to 2007 when I bought my second ever pair of running shoes which were Asics Gel Nimbus VIII which were £100 but were the comfiest shoes ever and I tried on the Nimbus and they were as comfy as a cloud and I went on the treadmill and the man said I was a perfectly neutral runner and didn’t have the slightest hint of over-pronation and so these shoes were right for me and I said to him you’re going to tell me they’re £100 aren’t you? And he said um, they’re a bit more than £100 and so I tried on the other shoes he brought me which were Adidas and Nike but I didn’t like them and so I said ok, I’ll buy the expensive ones, how much are they? And he said £120 and I thought eek and I said I’ve got a 20% off voucher, can I use that? And he said yes and so I bought these very pretty but very expensive Asics Nimbus 13s. And then the man brought Shaun some shoes to try on and he bought a pair of Mizunos and then told everyone on Facebook he’d bought a pair of Brooks until fairweatherrunner asked him which Brooks he’d bought and so to stop me outing him for getting the brand wrong he confessed they weren’t actually Brooks and then this morning LOOK WHAT THE POSTMAN DELIVERED TO ME! These are the most beautiful running shoes I’ve ever seen and they are Nike Free 3s. 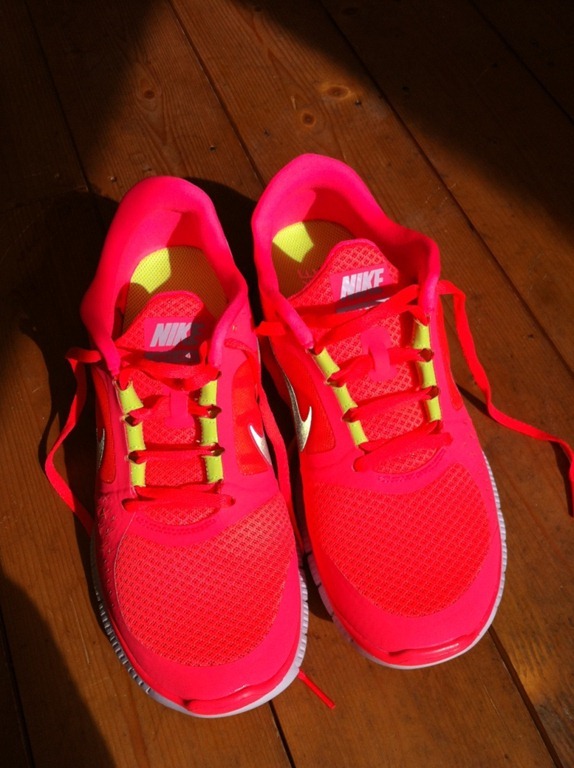 They’re very light and I probably won’t wear them running but I will wear them down the gym and review them then. 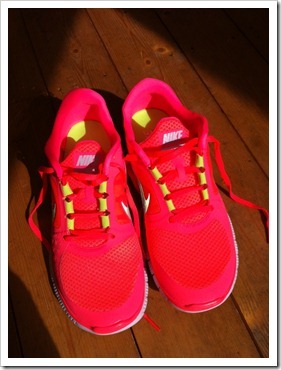 Anyway, although I ran yesterday, because I am a girl, I wanted to try out my new shoes and so I went for a short run. All good Juneathon preparation, eh? 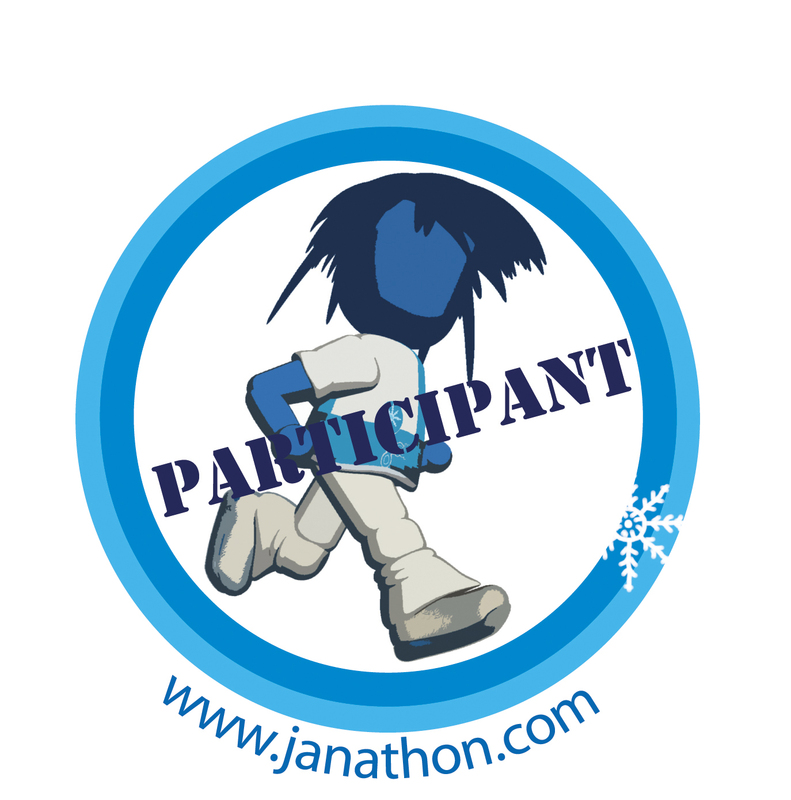 And, talking of Juneathon – if you haven’t signed up yet, get on with it, you slackers. I totally sympathise with your shoe dilemma. 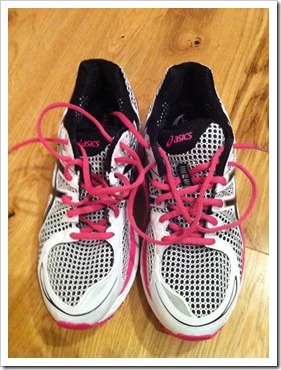 Whilst training for my first marathon, every time I felt a twinge I would blame it on my shoes. Over a 6 month period I bought 3 different pairs of Asics at about £60 each. Might have been better off buying one good pair for £120. The fact that I’m not getting younger and doing a lot of miles each week never crossed my mind as a possible cause of my ailments! 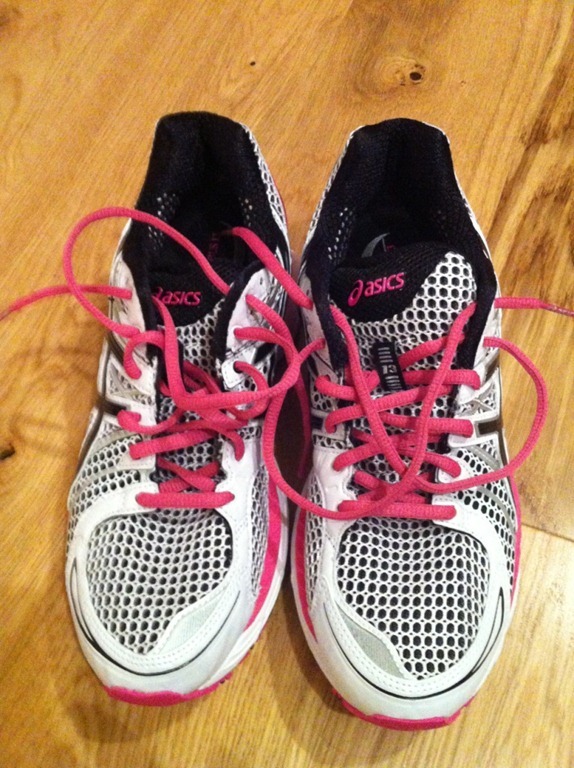 Did all my (injury free) marathon training in asics gel nimbus. Had previously been a new balance girl. Deviated in recent years. Just found my way back. What was i thinking? Love gel nimbus. End of. Whoever said running was cheap was lying! Love the look of both pairs, are you starting your marathon training yet? I’ve just got back into exercising again, after almost a month off. Can only run about a mile at the mo but I’ll get there. Need to send off the form for London Marathon and the entry fee by the end of next week.